NT Warlock FR Widow, Other Shape Guitar from B.C. Rich in the Warlock series. Ju13090's review (This content has been automatically translated from French)" Unquestionably the best"
I'll make it very short because I have already made the review of two other bc rich of the same range. The handle is more flat than the Stealth, much nicer, the key is almost flat. The guitar is very heavy, no worry to reach the last box, much easier than the stealth. 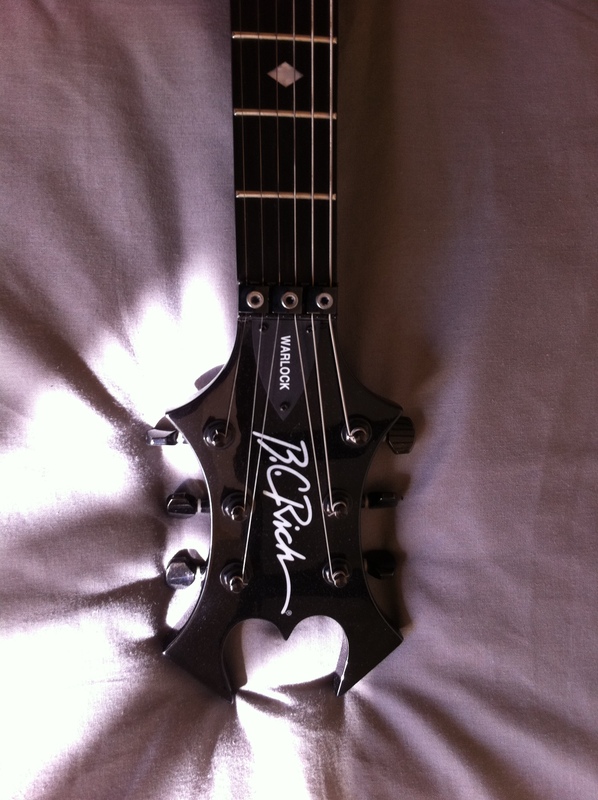 I've always liked micro BC Rich malgès everything people say, warm, round, powerful and versatile. The sound is just huge, and I'm not talking about microphones, but the wood quality of this guitar. I have a Stealth draco and this one, all neck-through. The warlock buried the other two, the sound is monstrous sustaine the guitar without ever stopping, setting the action can be very, very low ones, and I stress the above this determines a quality guitar. All the boxes and all the notes sound so exceptional, I found a 240euros in a store in zik occasion. 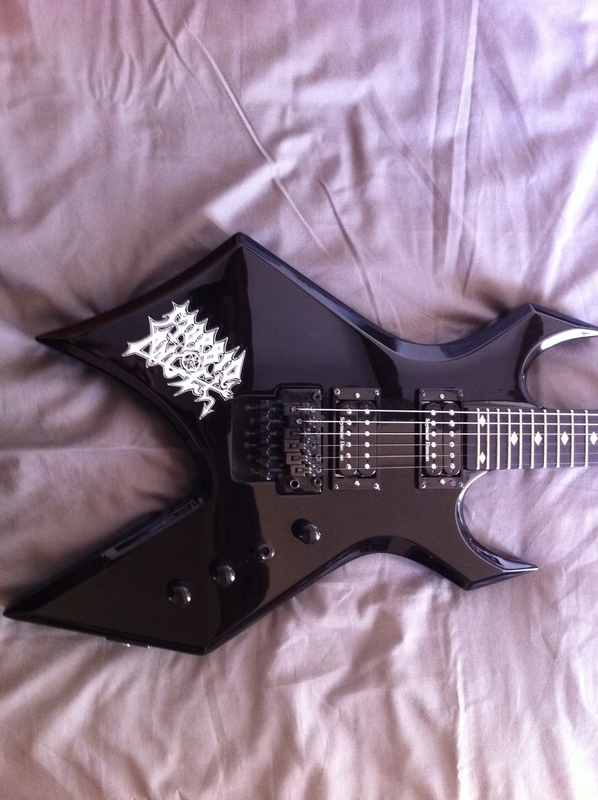 This guitar is simply amazing. For those interested it is a 2009 model, if you find one you will not regret. Much better than the Stealth is already very good. fender-alex's review (This content has been automatically translated from French)"Not bad at all"
Honestly I bought when I started mainly for the form, finally after 4 years of use, the violin is not so fantastic in it in the air, the microphones are feeble (which is a shame for this type of guitar) so I installed a kit home active pickups EMG (respectively 81 and 85), the sound became more than adequate. - The handle is it fun? Well, I say yes. despite the problems that I have to fret Re-enter, the handle is rather late, the strings rather close to the handle. allows the handle so fast and fluid solos effortlessly. rhythmic side, the handle is convenient and reasonably well. 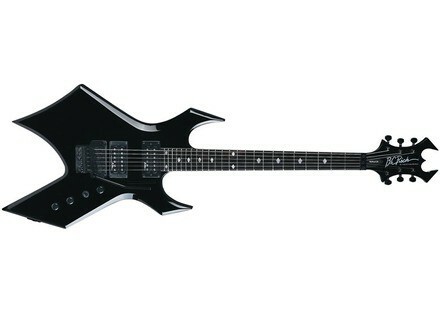 The body shape of this guitar is excellent for the fans of metal of all kinds. weight is correct, it is still extremely fragile and tends to bite the head in an upright position (ie a priori balancing problem). - Access to acute (last fret) is it easy? Access to acute is incredibly easy, despite the stop (because the handle screw). It reached the 24th box very easily. - Gets it easy to sound good? Get great sound with this guitar is almost the original challenge, however with a little patience and another micro kit can be found a very good sound and good custom. As explained above, I installed a kit with active microphone EMG (which I highly recommend by the way). Is rather versatile, I play absolutely any style (classical, in the brutal death through the country or blues ...). I would say that the sound should be almost perfectly has everything I play. I will describe the sounds obtained clean, crunch, distortion, lead with two sets of microphones. its a bit chubby and domesticated, not enough lens for my taste. slamming her a little too loud anyway. its a rather balanced and quite nice in itself. its too round, regardless of attack, disappointing. her screaming, a lot of attack. a good compromise, the roundness of sound with a good offense. its too poor for the distortion. not too aggressive but still too timid for my taste. the lead is pretty nice, round sound and very warm invitation to compose a long solo ride. more aggressive and not too bad ideal for lovers of tapping or sweeping beginners. not recommended for the lead. its very very very round at times recalling the sounds of old acoustic guitars, huge potential to exploit. a sound very reminiscent of slamming guitars and a little country sound of Telecaster (I have an American). the crunch is forgotten completely the neck pickup to pick up. very good though somewhat feeble attack. fans of heavy rhythmic welcome. added to the micro instrument making the warlock is perfect. bass, her round, little acute medium which is a shame. big big attack, delivered wholesale. perfect for solos with big "rack" or languid solos. then in the lead, one step above. harmonic whistling wishes. big win (yes it&#39;s active) then necessarily the legato is going incredibly easy, additional sleeve extremely handy the warlock makes the game even more impressive. Zakk Wylde solo so welcome. In summary I play in my Marshall 100W is more than enough even if the sound is not great. Live, I play on the Engl powerball and it laughs more, it seems to change the world. The distortion is beautiful, extremely expressive solos and the sound is very customizable. I use it now for 4 years and is part of my guitars on stage. 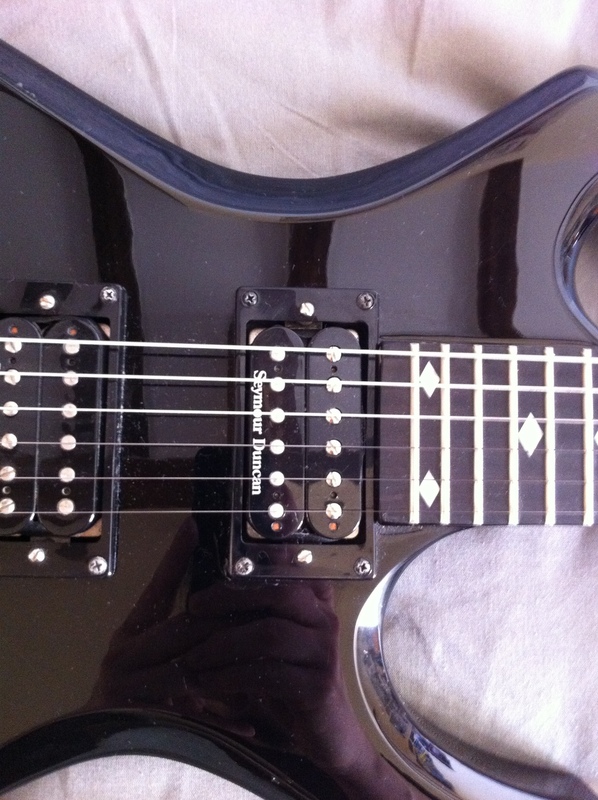 After changing pickups it becomes really fantastic and with the mouth of a killer can only ask for more. Most of this guitar is its look and can easily guess. The least is that it is bulky and find a box of transport is not necessarily the easiest of all. In addition, the balancing problem can quickly become uncomfortable on stage. 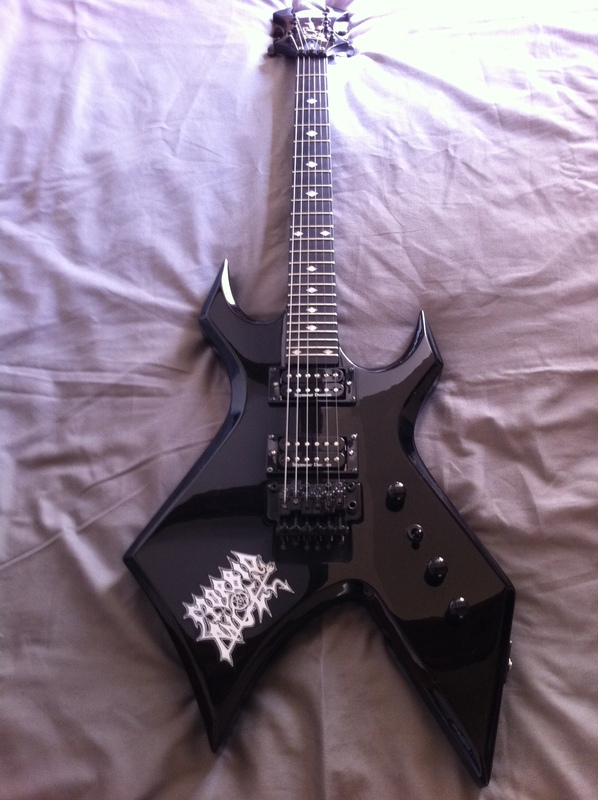 Actually before I had tried to acquire any model, this was my first real guitar. The value for money is excellent, no complaints. With the experience I do not regret that choice, it&#39;s a bit that has guided my playing and give a different face in my game now weighing the pros and cons, I would probably rather oriented a gibson or ibanez rather than this one.